When you sit, just sit. 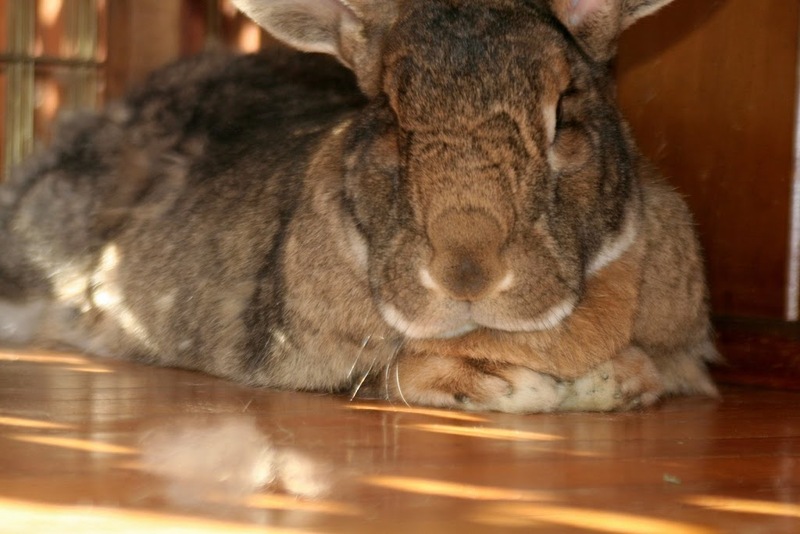 Boomer with a real dustbunny, for size-comparison. My favorite garden center is offering $10.00 off the purchase price of any plant you choose to replace your dead or dying poinsettia with… so long as you show your black thumb, admit defeat and bring the horrid thing along with you for trade-in. I wonder what they’ll do with them. 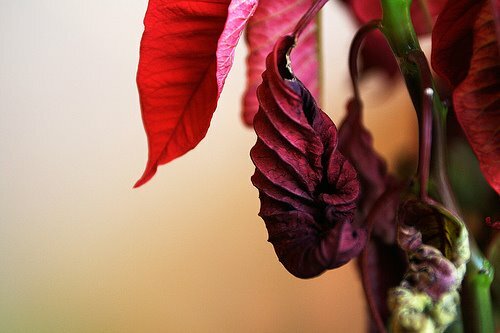 Can a dying poinsettia be rehabilitated? Statistics from the National Low-Income Housing Coalition indicate that the average “housing” wage needed to afford a two bedroom apartment in NJ is approximately $23.00 per hour. A “living” wage, which would also include the costs of food, utilities, daycare, transportation, insurance and the other expenses of family life would have to be… how much more? Half again, at least? Considering that the “minimum” wage in NJ is just $7.15 per hour, most of our preschool teachers, home health aides, security guards, accounting clerks, cashiers and receptionists would have to work three full-time jobs just to pay the rent. Read that again, maybe. There’s not enough hours in a week, I don’t think. Is it the same where you live? Do you even care? I got to do something really fun for work today. Each year, counties in NJ and across the country, conduct a survey of the homeless population. The data gathered includes questions on how long a person or family has been homeless, how many times they have experienced homelessness in the previous three years, what incidents may have led to their homelessness and where they stay during their time homeless (hotel, shelter, on the streets, etc.) The survey asks about the services they may need, what they have been turned down for, and what they currently receive in an attempt to measure gaps in local services. The information gathered is used to justify federal grants for homeless services. It’s a fine opportunity for local politicians to get their photo in the paper serving lunch at the soup kitchen down the street and for social workers like me to do something a little different. I’m asked to help out because I’m bilingual and because we have a good number of undocumented workers in our area that are needy and under-served by community resources. I spent the day completing silly surveys, handing out donated winter coats, blankets, toothbrushes and interpreting for the visiting nurses who were doing free health screenings. And listening to stories. Wonderful stories from hard-working people who have a lot to offer. Some of my coworkers were out before dawn at the places where illegals gather to find work, in order to connect them with basic services like free clinics and food pantries and legal aid. Others were in mobile units visiting the homeless in abandoned buildings, or along the boardwalk, or in tent communities in the woods. Yes, people live in the woods. Working people. Does that surprise you? Anger you maybe, I hope? A great many of us live with blinders on, I suppose, or imagine the poor to be deserving of the card that life has dealt them. They’re mostly lazy and like living off government handouts, right? Do you know that cash assistance grants to families on welfare haven’t increased in more than 21 years? That a mother and child on welfare receive just $322 a month, plus a similiar amount in foodstamps, to live on? How long would $322 plus some milk and bread last you? I’m faced with these numbers everyday when I do my federally-mandated job of promoting self-sufficiency for my clients. We work on budgets and planning for the future and how to make things better. The best many can hope for is a minimum wage job, which in turn, will trigger a loss of free daycare, free health insurance, free transportation and free or reduced housing. How can I sincerely push them into a full-time job that’ll keep them well below federal poverty standards and with no safety net? None of these people are truly homeless, of course. We’ll put them up, if need be and for the sake of the children, in some seedy motel, or a horrible smelly shelter. We call that enough and blame them for it all the while. Illegal aliens, the general public will be happy to know, receive nothing from the government. Nothing. They are not among the homeless, generally, and are very good about making do. They rely on non-profits and churches, but mostly on each other. Plus, they’re gracious and say thank you for this out-of-style-coat-that-doesn’t-fit exactly-right and then compliment you on your poor Spanish. All of which feels pretty nice. The ones we really need be concerned for are the elderly, and veterans, and the mentally ill. There’s no real way to reach them, no program in place for the ones that have truly been wronged by fate. PD: Be an advocate for affordable housing in your area… learn the statistics… speak out! 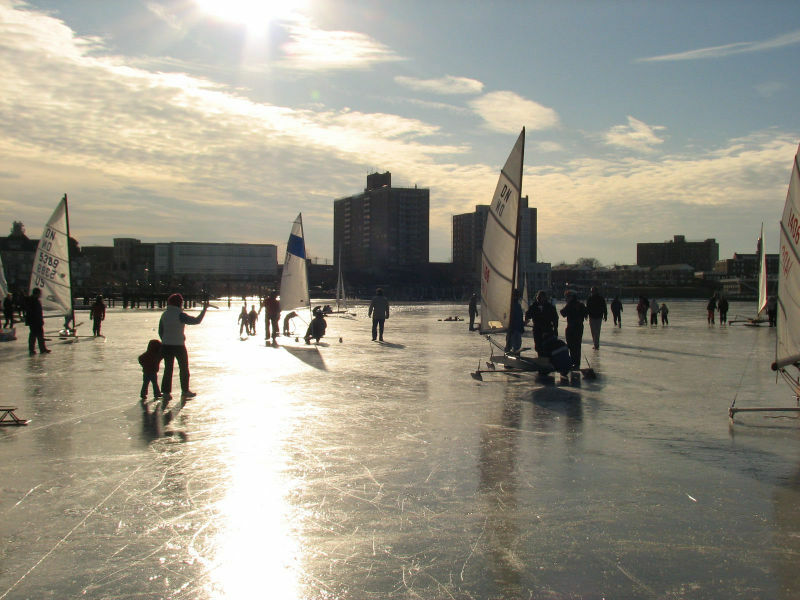 A couple iceboats on the river late this afternoon evicted the gulls from their usual loafing spots on the ice. 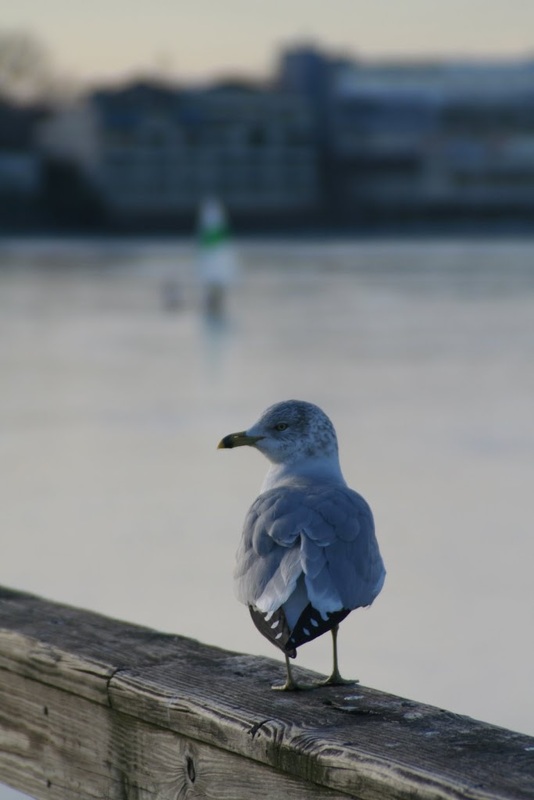 Click on the pic to see how handsome he is – even for a sleepy gull. and this wide view of the scene taken from mid-river. With silver-frosted muzzle and eyes hazy with age, an old wolf lives out his days captive to the benevolence of his more robust packmates. 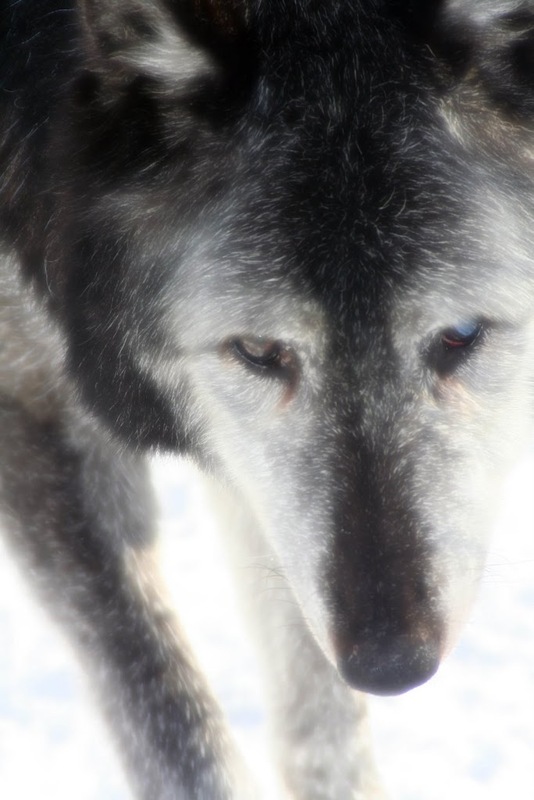 At sixteen or so, this one was among the oldest of the wolves at the Lakota Preserve and had been ousted from his position as Alpha in another pack. The fight very nearly killed him, or would have, had it not been for his caretakers who’d had his throat sewn back together and his blinded eye tended to. He was relocated to a different pen with another, gentler, pack where he’s been accepted in his new submissive role. Despite his submissiveness with the other members of the pack, he was quite confident and unaffraid with people, yet tame enough to be hand fed biscuits through the fence. Diminished though they may be by captivity and I believe they must be, this is the wolf – the symbol of wildness for many. In them we see something unrestrained and noble, something ancient and fear-inducing. Much of that mystery is reduced, I think, by the high chain link separating us, but some is still there in the aloofness they carry with them, even as they submit themselves to our wide eyes. 1. Do you like blue cheese? I love it, especially in a salad with fruit. 2. Have you ever smoked? Only when I can’t help it. 3. Do you own a gun? No, but Luka has this toy that shoots tennis balls. That’s pretty dangerous, too. 4. What flavor Kool Aid is your favorite? Kool Aid is gross, unless it’s frozen in an ice cube tray and you’re 8. 5. Do you get nervous before doctor appointments? Yeah, so I mostly avoid doctors. 6. What do you think of hot dogs? Mustard and ketchup, please. 7. Favorite Christmas movie? I can’t think of a single one… wait… I like Jimmy Stewart so whatever one that is that he’s in. 9. Can you do push-ups? I can, yeah… thanks to plank pose in yoga. 10. What’s your favorite piece of jewelry? Jewelry’s not my thing, but I do have a couple well-loved things that I’m really sentimental about. 12. Do you have A.D.D? Most certainly, yes. Only it wasn’t called that back when I was in school. 13. Do you wear glasses/contacts? I need glasses for distance, but only wear them to drive. I was cross-eyed as a kid and wore glasses (and a patch!) to correct that, so I’m a bit vain about glasses now. 14. Middle name? Claire, after my mom. 15. Name thoughts at this moment? Thinking I should buy some more songs by Amos Lee from iTunes. 16. Name 3 drinks you regularly drink? Coffee, seltzer, Blue Moon. 17. Current worry? That I’m not worried enough. 18. Current hate? I hate that I don’t have a sled, or a hill nearby, or snow. 19. Favorite place to be? Right now. 20. How did you bring in the New Year? At my brother’s; it was quiet except for the trumpet and pots. 21. Where would you like to go? Just about anywhere could be fun, I think. 22. Name three people who will complete this? Other lazy, brain-dead people. 23. Do you own slippers? No… I love to be barefoot. 24. What color shirt are you wearing? Black. 25. Do you like sleeping on satin sheets? I imagine them to be too slippery. 26. Can you whistle? Yes and do so absent-mindedly, annoying my coworkers. 28. What songs do you sing in the shower? None. 29. Would you be a pirate? Well… I have worn an eye patch. 30. Favorite Girl’s Name? Don’t have a favorite. 31. Favorite boy’s name? Don’t have a favorite. 32. What’s in your pocket right now? 37 cents and a bank receipt. 33. Last thing that made you laugh? I had a really good belly-laugh this afternoon listening to my voicemail messages at work. A client was making excuses for her late rent payment and blamed it on the snow here and the heat in Florida… nevermind, but it was hilarious! 34. What vehicle do you drive? Honda CRV. 35. Worst injury you’ve ever had? I had stitches in my chin once from a fall as a kid. 36. 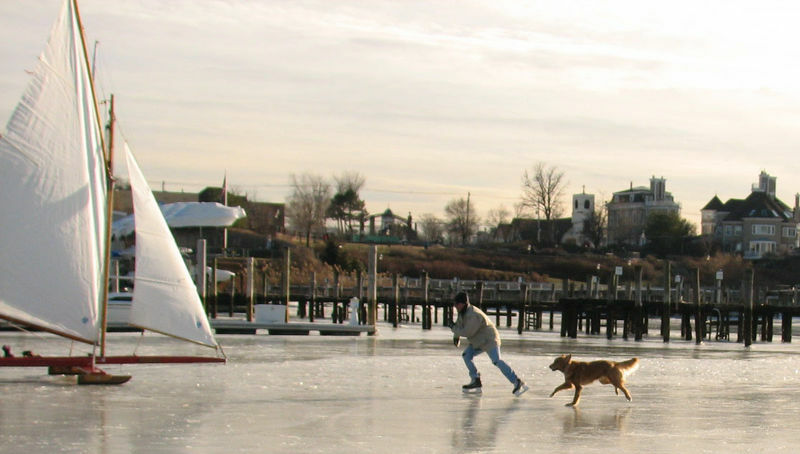 Do you love where you live? No, but the where doesn’t figure much in that. 37. How many TVs do you have in your house? Two too many. 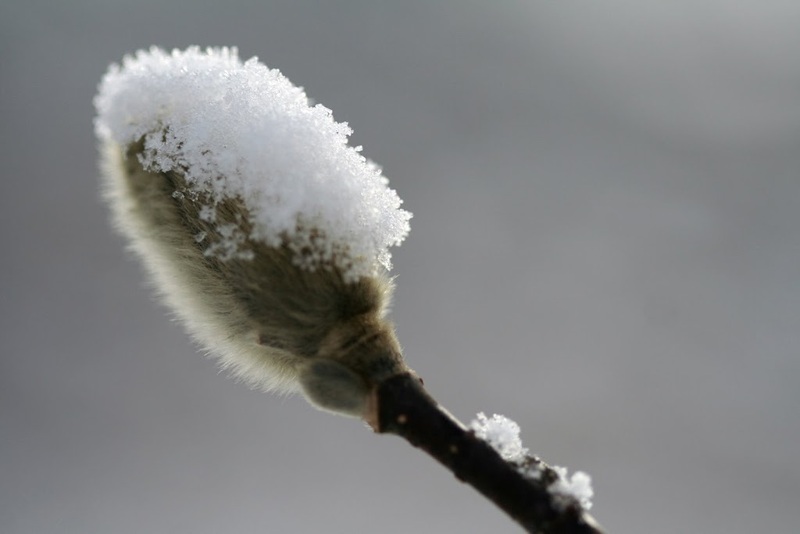 Star Magnolia bud: snow-covered velvet. Last summer’s Queen Anne’s Lace: a nest of winter’s making. Me: Gray. Blah. I want bloom! I want pink and yellow and white and bees! I watched the inauguration today with my coworkers, each of us huddling around a couple computers, none of the broadcasts in sync, ringing phones adding to the din as if nothing monumental were happening. This was only the fourth time an *occasional* poem was commissioned for a presidential inauguration. What’s up with that? I watched hours and hours of the ceremonies repeated this evening on C-SPAN and really enjoyed that poem at the second hearing. There is something about poetry read aloud that goes straight to my center. Most people seem to think it was awful. Any thoughts of the day? The poem? The speech? The dress? 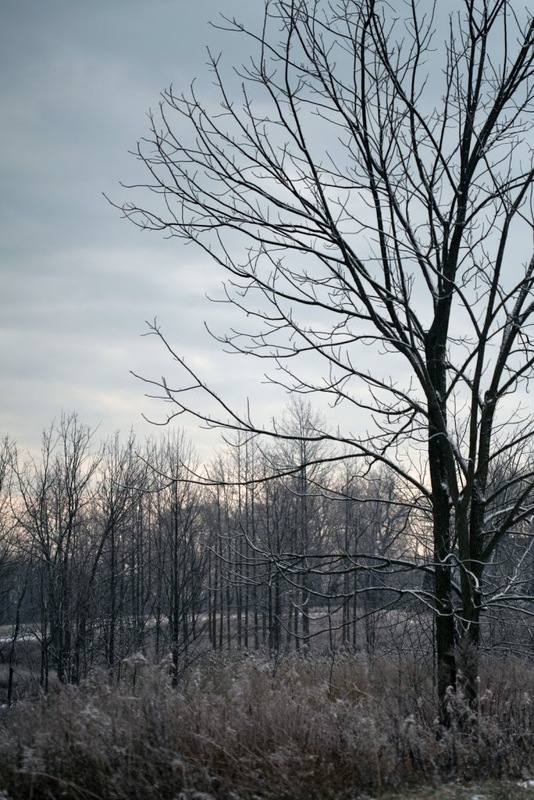 A sullen mostly overcast day, but the gray winter world was made beautiful with the dazzle of sun on last summer’s goldenrod and fluffy cushions of white in the forks of trees as black as ink. There’s a kind of rightness and predictability in bird behavior that is almost comforting to me. 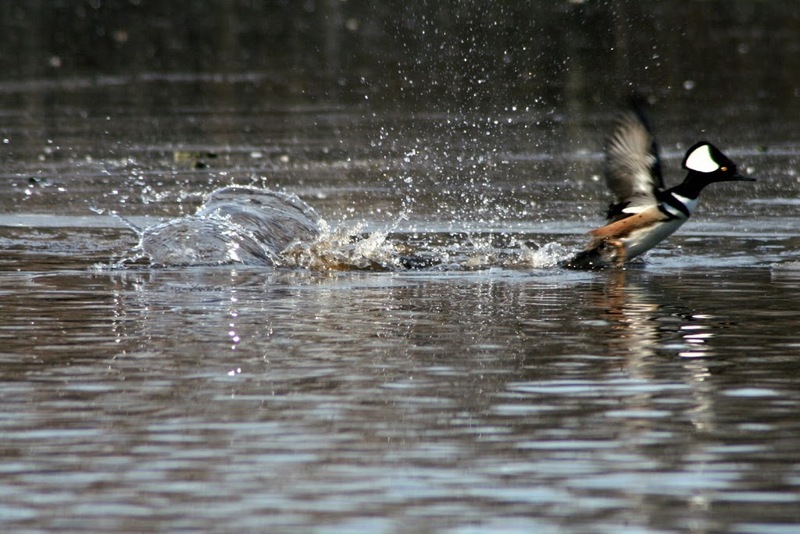 Knowing to expect that every last hooded merganser will take flight to the farthest edges of the pond when I raise my lens confirms to me that I know one aspect of this species pretty well. Waiting for the local pair of osprey to begin setting up housekeeping in mid-March or the woodcock to twitter and spiral through an early spring dusk or merlins to streak low through the dunes in late afternoon looking for a meal to keep them through a night’s chill… all enhance my awareness of life’s insistent rhythms and set a pace for my own schedule in harmony with a larger, more universal system. There’s also the realization that birds have important lessons to teach us; about being careful and its necessity for survival (hoodies are overly careful, I think) and about beauty and stirring the imagination (think of a flock of terns dropping from the sky into the summer blue bay or a scarlet tanager suspended in an oak) and also, they teach us about hope. I found that hope looking me squarely in the eye a few weeks ago. Along an often-walked path through the local woods, I looked up a tree trunk one afternoon to find it looking back at me, in that magical way that owls have of appearing out of nothing. I’d stopped looking for screech owls along that path a couple years ago when their nesting box was vandalized, but this one had found a little hole in a nearby maple with which to frame his unblinking face. I think we both were somewhat shocked to be seeing one another, his face full of concentration at not being seen and mine one of pleasant surprise at learning that sometimes good birds are closer than we think. What good birds have you found lately and what did they offer you?